We offer a full range of wetsuits and drysuits to keep you warm and on the water for conditions ranging from the peak of winter season to spring time short suits. Different suits offer different neoprene thicknesses for the core, torso, and arms as well as different technologies for sealing the seams to keep the water out. Some suits even offer integrated hoods. Spring suits are great for staying warm during some of the spring or fall riding months when it's too warm for a full suit but not warm enough to for boardshorts. Spring wetsuits have some combination of long or short sleeves and long or short legs. Full wetsuits are great to stay warm when the temperatures start to drop. Extend your kiting season with a nice wetsuit to keep you warm and on the water longer. It�s no fun to be cold on the water and if you ever have to swim in, the extra warmth of a nice wetsuit could save your life. Stay dry and toasty this winter with a drysuit. Drysuits give more mobility than a wetsuit and allow you to stay warm outside of the water as well without worrying about wind chill. 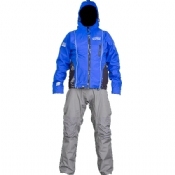 With a drysuit you can wear layers of clothing to stay warm during your kite session or on the beach.